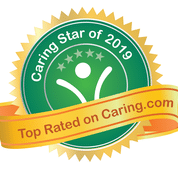 Flowery Branch, GA January 15, 2019 — HOME CARE MATTERS is pleased to announce it has been selected as a “Caring Star of 2019” for service excellence in senior care. In consumer ratings and reviews on Caring.com, HOME CARE MATTERS earned a 5-star rating (the highest possible score) within the qualification timeframe, while also having a high volume of positive reviews and meeting other criteria for this national honor. They are the only home care agency who earned the Caring Stars 2019 award in Hall county, and HOME CARE MATTERS is among only 446 Caring Stars agencies across the country for 2019. Online reviews help Americans research and select the best senior care providers for aging or ailing loved ones. In multiple Caring.com research studies, the majority of family caregivers have indicated that they turn to the Internet and consumer reviews when narrowing their options among home care agencies (and senior living communities) in their area, and have relied on these perspectives as much as or more so than in-person recommendations from geriatric professionals or medical personnel. 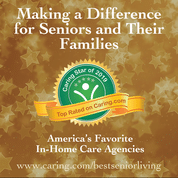 Originally launched in January 2012 as the first of its kind, the Caring Stars annual list has become the go-to guide of the best senior care providers nationwide – particularly helpful after families gather for the holidays and discover increased or urgent senior care needs for their elderly parents or grandparents. To be considered for the award, home care agencies met a set of criteria based on ratings and reviews from senior clients and their family members — with those reviews analyzed by Caring.com staff (rather than computer algorithms) to determine the home care agencies with the best consumer ratings. Valerie Darling is the founder & owner of Home Care Matters. It was through Valerie’s own personal experience of caring for her mother, Dee Darling, for 5 years that the business was born. Valerie has 30 years of Corporate experience with Fortune 100-500 companies in Sales, Customer Service, & Senior Management. She has taken that professional experience along with a personal vision of how to provide a better experience, service & quality of care. She determined that the best way to do this was to start a local, community-based business that is personalized, customized, with heart-felt care & a passion for people (both clients & caregivers) & is obsessed with service. ‘Our goal is to have clients stay independent in their own homes, where they are happiest, by providing a safe, nurturing, & safe environment.’ Valerie’s mom Dee laid expectations for her own personal caregivers, and we provide the same expectations for your family. Clients & caregivers can meet before starting our care program and you can give your caregiver your own “DEE” Test: “If we wouldn’t want them caring for our mom, then we’re not placing them with yours”. We are firm believers in personality compatibility along with the skill requirements for a personal placement & we hire based upon that rather than just a ‘warm body’. With millions of website visitors, Caring.com is a leading senior care resource for family caregivers seeking information and support as they care for aging parents, spouses, and other loved ones. Applying cutting-edge technology to its social mission, Caring.com provides helpful eldercare content for caregivers and comprehensive senior living and senior care directories for the United States — with more than 200,000 consumer reviews and a toll-free referral line at (800) 325-8591. Home care agencies and senior living communities may also visit our industry blog for further information: https://partners.caring.com.